petition: Clean Bees Make Clean Honey: Call on EPA to Ban Chemical Contaminants Found in Honey that Harm Bees and are Human Health Hazards! Clean Bees Make Clean Honey: Call on EPA to Ban Chemical Contaminants Found in Honey that Harm Bees and are Human Health Hazards! Hi, I'm Benny. As a honeybee, I grew up on agricultural pesticides and chemical antibiotics and it's really starting to affect me and my colony. I'm exposed to dangerous pesticides when I'm out pollinating and foraging for a nectar source and then I'm administered chemical antibiotics by my beekeeper once I get back to the hive box. Repeated exposure to these chemicals can severely impact a bee's life and its entire colony from death to illness, to being lost and confused to colony contamination. Not only that, the chemicals can accumulate in hive boxes and end up in your honey. Bee pollen can be chemically contaminated with a concoction of at least 17 poisonous pesticides! In a recent examination of honey samples from various locations in the United States, the Food and Drug Administration (FDA) found residues of the weed killer, glyphosate, in all of the samples. According to documents obtained through a Freedom of Information Act request, some of the honey samples showed residue levels double the limit allowed in the European Union. There is no legal tolerance level for glyphosate in honey in the United States. Glyphosate, which is the key ingredient in Monsanto Co.’s Roundup herbicide, is the most widely used weed killer worldwide. Concerns about glyphosate residues in food spiked in 2015 after the World Health Organization stated that its cancer experts determined glyphosate is a probable human carcinogen. Aside from pesticides, harmful man-made chemical antibiotics are administered in apiculture for the treatment of bacterial diseases and these antibiotics also end up in the honey. Domestic beekeepers are victims and don’t have any control over these environmental impacts. Bees can travel up to four miles away from the hive to forage for a nectar source and they are pollinating genetically engineered crops that are sprayed with pesticides and bringing them back into the hive. Beekeepers also need to be educated and provided antibiotic alternatives to keep their bees safe and healthy. You can help by signing this petition asking the FDA and EPA to ban dangerous pesticides and the use of chemical antibiotics immediately! In contrast to domestic honeybees living in boxes, there are free range honeybees living in wild beehives in the untouched forests of Northern and Central India and parts of the Himalayas. These wild beehives contain the purest and most delicious honey available worldwide. This is where Heavenly Organics honey comes from and it is unlike any other honey on the market. Heavenly Organics Raw Honey is 100% organic and Non-GMO Project Verified, which is unattainable in most regions today. Since these naturally occurring, wild beehives are found in such remote areas, the bees are far from the reach from pesticides and other pollutants. Also, since these bees live in wild beehives, and don’t have beekeepers, they are never exposed to chemical antibiotics. Heavenly Organics®, manufacturer of 100% organic, raw, pesticide and antibiotic free honey from wild beehives, is committed to building awareness of the detrimental impact that pesticides and chemical antibiotics are having on honeybee colonies with the launch of its "Clean Bee" campaign. 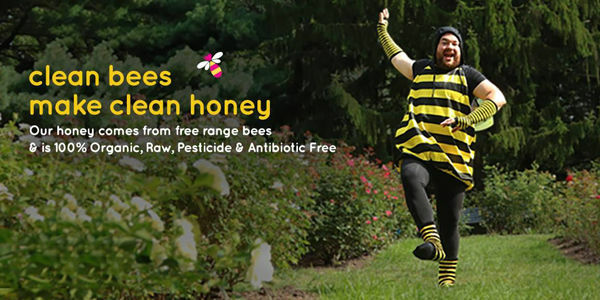 To view the "Clean Bee" videos, visit the Heavenly Organics YouTube channel here.